The sun is down and you're trapped in your bag for the next half a day, what do you do? But you said to always hike with a small group didn't you? As solo hikers, we bear the scorn of the outdoor world. Outing clubs view us with disdain and park rangers scowl as we register as a "party of one." So for those of you wondering what one may be doing for twelve hours in a sleeping bag, you may not be winter campers or backpackers. When it gets dark at 5 PM and the sun doesn't rise until 7 AM, you have A LOT of down time. When the sun dips behind the mountains and the mercury dips well below zero, it only makes sense to retreat into the cozy confines of your sleeping bag. Winter night hiking has its dangers after all. Walking off an icy cliff or falling into a snow crevasse is as easy as falling off a log (also easy to do) while stumbling around in the dark on skis or snowshoes. You dislike your hiking partner and can't stand them, they are only with you for safety. Your hiking partner doesn't speak your language. You may not even be sure if they are really a hiker or merely following you to that hidden poppy field in the middle of the forest. Your hiking partner falls asleep as soon as their head hits the stuff sack and stays in hibernation until you shake them awake the next morning. You have taken a vow of silence. Even worse, the people hiking with you took one. Taking strange pictures of yourself is a great way to pass the time while stuck in camp. It's hard not be entertained on a cold winter night by taking strange pictures of yourself. Why strange, you ask? 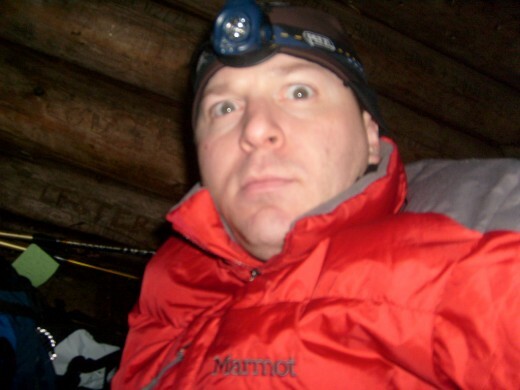 You're camping in the snow, and taking pictures from an arm's length way - you have no choice but to express your oddness. So why would you do do this? I started this as a documentation of my long winter nights. As the night progresses, you will see yourself in various states of weirdness. Also, these strange pictures are great for punctuating all the beautiful scenery photos you have. Believe me, people won't get bored watching another hiking slide show of yours. One of the beauties of digital camera is instant gratification with picture review. With film, you had to wait weeks to find out that you looked like a crazy person. Just remember not to wear down your batteries. Yep, I said to cook in your sleeping bag. And yes this can be dangerous for the moron-inclined. Also, this is a winter-only activity, if you don't know why think of large curious omnivores with large claws and huge appetites. Even without Yogi wandering around the winter landscape, there are still a myriad of critters that love spilled ramen noodles. Also, if you haven't realized, there is a slight chance of burning to death in a fiery flash of ignited nylon and down. Likewise, there is a chance of taking a very long nap after ignoring every warning label on your stove and succumbing to an abundance of carbon monoxide in an unventilated area. Remember, the stove goes OUTSIDE the tent. Now that the safety briefing is out of the way, yes many winter campers cook and eat from their sleeping bags. You may find this difficult, but things are much easier after you unzip and stick your arms out. 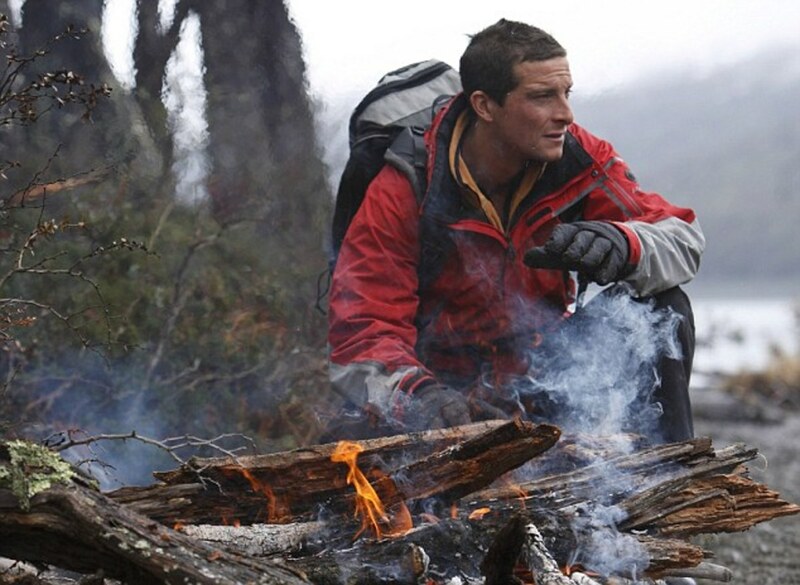 Remember that the average winter backpacker burns about 550 calories per hour (about 4,500 per day). You need a lot of fuel to stock the internal furnace that is keeping you warm. Yes, Doctor Oz says not to eat in bed, but in the winter - you can make an exception. Anyway, who can take a guy that goes by "Oz" seriously? 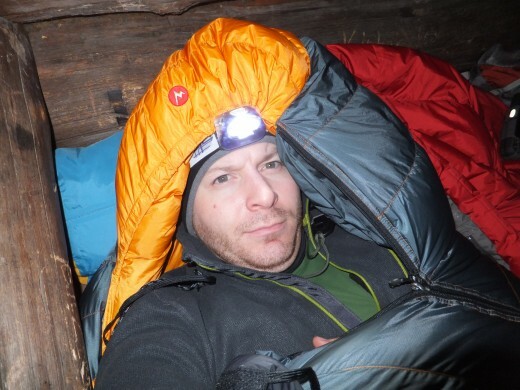 Outbound Dan Human shares his winter backpacking gear list for backpacking in the Adirondack High Peaks. Again, get your head out of the outhouse! Gear junkies know how cool the latest backpacking gear is, and what better time is there to discover that your stuff sack doubles as a hat then when you are tent bound for the next twelve hours. Some hikers personify their gear, naming it, and accounting for its personality. 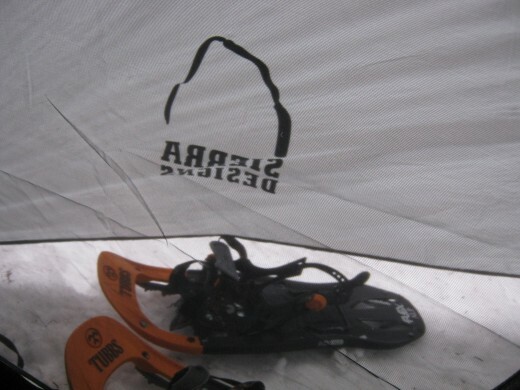 One solo hiker, who shall remain nameless, names his gear after philosophers and writers. He can be heard moderating arguments between Kierkegaard and Emerson well into the night. From a practical point of view, messing about with your gear is a great time to prep your supplies for the next day of hiking. Having your pack as ready to go as possible, will help get you going for those early alpine starts. Sure you could bring a book, but just think of the extra weight. 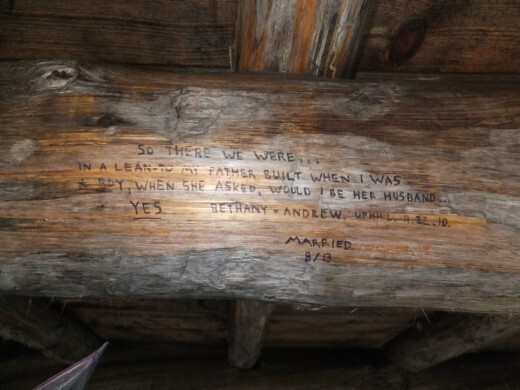 For lean-to campers there is no better time-passer than to make a study of the graffiti and carvings on the simple log walls. It is with great surprise the number of people that proclaim their undying love by crudely chipping names and hearts into the rough hewn walls and support beams. Though these messages provide hours of entertainment, it lacks responsibility to leave your mark on the hard work of others. If you built the shelter, you can carve into it, if not - leave the knife in your pocket. For those of you not spending the night in a lean-to, or in an area not frequented by graffiti marking miscreants, a book is a pretty good companion too. For the ultralighters out there, a small MP3 player with audio books is a fantastic flashlight free diversion. As a suggestion, skip tales of horrible woodland bloody murders; you'll sleep better - trust me. When huddled in your cocoon of down, warm from the elements and relaxing from a hard day of backpacking, writing is a great way to wind down. Often the notes you jot will be incomplete fragments of semi-consciousness and heightened awareness. Generally notes taken in the woods lack the refinement of civility, but they offer fantastic insight into your soul. "The secret of it all, is to write in the gush, the throb, the flood, of the moment – to put things down without deliberation – without worrying about their style – without waiting for a fit time or place. I always worked that way. I took the first scrap of paper, the first doorstep, the first desk, and wrote – wrote, wrote…By writing at the instant the very heartbeat of life is caught." If writing on the fly, in the thick of the moment was good enough for Whitman, it's probably good enough for the scribblers among us. 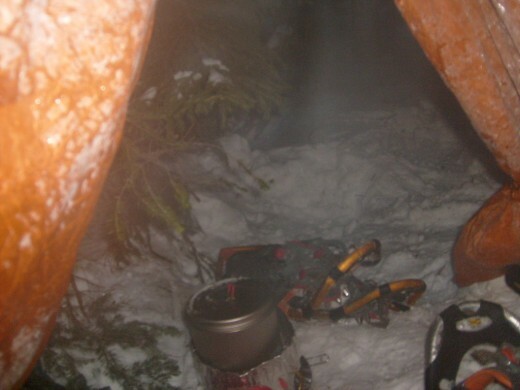 Heck, I've been known to get great ideas for outdoor articles, including this one, while immersed in my bag on a winter camping trip. When all else fails, when your batteries are low, your pen won't write, and you can't stuff yourself anymore, maybe it is time to sleep. And as your eyes struggle to stay open and the wave of sleep overcomes you, be assured - you will have to pee. It never fails. 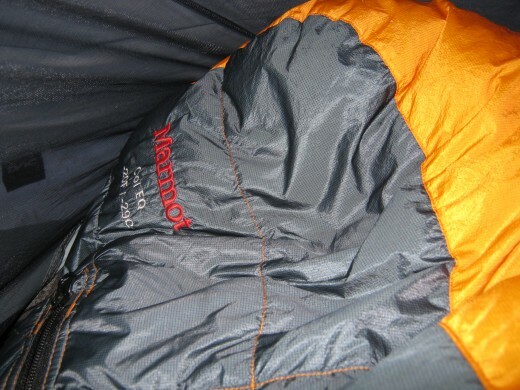 To stay warmer, and to make sure you don't pee your sleeping bag, make sure you empty your bladder. 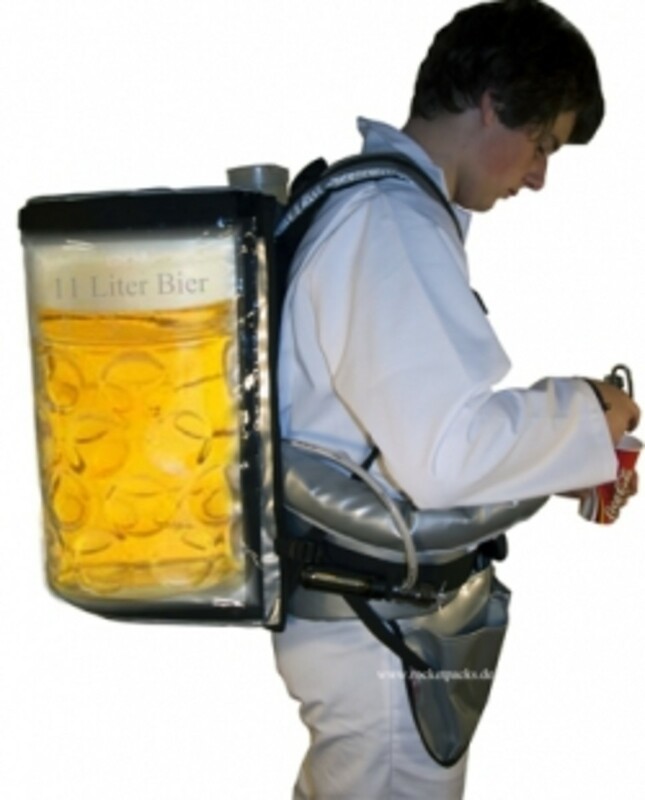 Many winter campers carry a bottle to relieve themselves in. Just remember to mark this bottle to make sure you, or a hiking partner, don't mistake it as an energy drink. Anyway, after writing your name in the snow or avoiding the cold and filling the bottle, feel free to nod off. Tomorrow starts early and it's going to be a big hiking day. So use some of these techniques to avoid going totally insane, get a good night's sleep, and stay warm! Yeah, winter camping takes a deep desire for subjecting yourself to the extreme cold, then again it may be a form of psychosis. Of course, with the right gear and the right technique it can be a pleasurable and soul-lifting experience. I had a great little MP3 player that was fantastic for audio books, however I killed it - time to look for a new one. There is always a balance between keeping your nose warm and being able to breath. 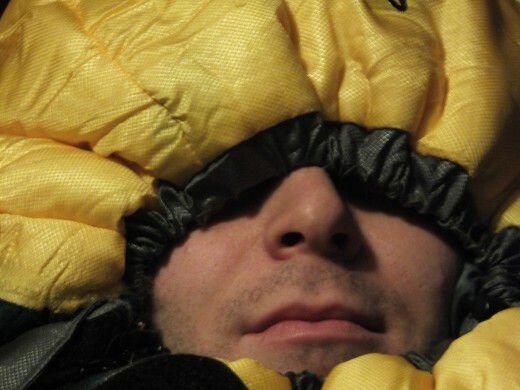 I found a great little half-mask from Mountain Hardware that has good nose warmth and adequate breathing space. I usually carry that as my backup mask and primary sleep mask. My latest discovery is to listen to audio book on my i-phone! Surprisingly, it doesn't use much battery! My problem winter camping is that my nose gets cold...any suggestions? Sweet - that was what I was going for in this Hub. Thanks for reading and commenting corascollection! Hey, fighting the long sleep of winter hiking is quite a hurdle, now we'll just work on some other skills and you'll be all set for a winter backpacking trip. Thanks ever so much for the votes, sharing and for reading Thundermama! I am so happy I stumbled upon this hub. I love your writing style and, although I never ever plan to winter hike for as long as I live, I now feel well prepared to while away the hours if I ever do. Great Hub, voted way UP and sharing. Like I say, winter camping is a great time to catch up on your sleep. 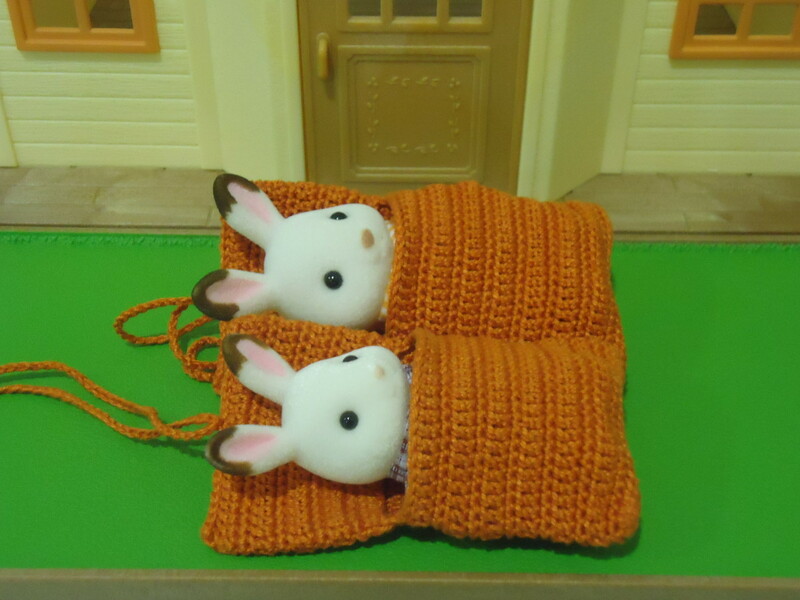 Of course, the sleeping bag is the only way to stop from freezing to death while you are not moving. This was great Dan! I have yet to venture into winter camping, so I haven't had to kill hours upon hours in a sleeping bag. I will keep this knowledge tucked away for future hikes! Thanks for the fantastic compliment Evelyn, I'm glad you enjoyed my musings. Once I get one of the many books I am working on completed, I'll be sure to make an MP3 friendly version too. I do have a solar USB charger from High Gear (Solar Pod)but I rarely carry it, unless I plan on being out for a week. I have great battery life on my Garmin Map 60 GPS, Petzl Tikka Headlamp, and Sansa MP3 player. As far as cameras go, I've carried my Canon PowerShot with lithium AA batteries in -30 windchills without issue. I've used my Fuji Finepix down to about 0 degrees. Generally I carry my camera in a chest pack to keep it warm. Thanks Steve, that sounds like a very cool independent study. Though I always look at winter camping as the time to catch up on sleep, I too usually only need about six hours of rest. As you drift in and out of consciousness, it's easy not to know the difference between the dream and reality. Great article as always. Long story short: while in grad school I spent 24 hours in a cardboard box to do something "outside my comfort zone." Gullible teacher bought it. Once it got dark I didn't know if I was awake or asleep. For someone that only sleeps 5.5 to 6 hours a night it was just like many a winter campout, a long night of strange dreams. Usually in the middle of night, especially after strange dreams, that rustle from chickadees sounds like a velociraptor coming after you. Usually that clanking pan is a pine marten dragging it away, but it could be a rogue member of Fat Albert's Junkyard Band coming to visit. Thanks for visiting and commenting jimmar. There is nothing like a game of Angry Birds while stuck in camp, just bring a solar charger and you are set. Thanks for reading and commenting Sturgeonl! One last suggestion for what to do when you are trapped in a sleeping bag...learn how to use all the features on your smartphone!Very entertaining hub! Thanks Turtlewoman, I'm glad my attempts at humor didn't go unnoticed. I've been known to talk to myself as well; the problem was - I got into some nasty arguments. Sometimes, it just got ugly. If my personified backpack starts talking back, I can just set it outside until morning. Thanks AnastasiaO! Glad you liked it. Dan! You are too funny! I will keep these tips in mind the next time I get trapped in the sleeping bag for hours. It's definitely more creative and entertaining than talking to myself. That last picture. cracked. me. up. Yeah, I mark my bottle with a large duct tape "x" to avoid any confusion and any unpleasant drinking experiences. Glad you liked it cclitgirl and thanks again for stopping by and commenting. Just when you think you can't pee anymore, as you begin to sleep - nature calls again. Thanks for stopping by Brian. Ew, that would be a big bummer to mistake the pee bottle for an energy drink. Haha. I love the part about taking strange pictures of yourself. Great hub! I usually just read, but now I have new options. And I always have to pee too, no matter what I do. Rule of nature.